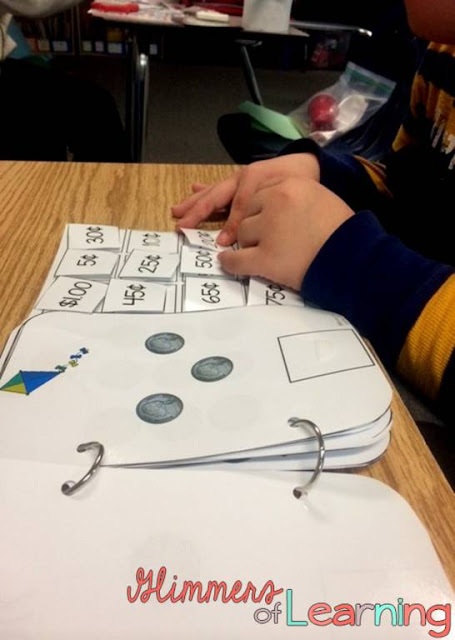 I know that teaching the concept of money can be difficult to students with special needs, and some who don't have special needs, but finding activities to keep them engaged and excited about learning can be difficult! 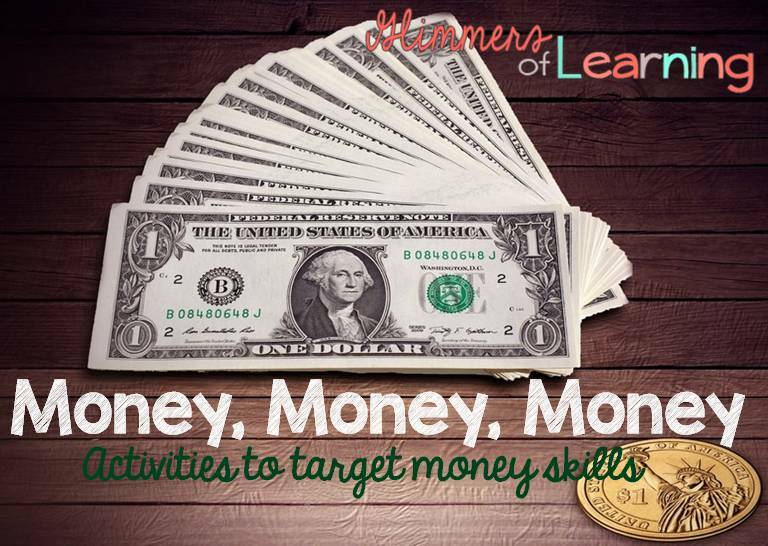 Here are some of my students’ favorite money activities! This is one of my new favorite games! I cannot take credit for this game as I found it on Growing Kinders website and ran across her post about how she uses it in her kindergarten room! The first thing you need to do is glue plastic coins onto Popsicle sticks. My favorite part about this game is it can be differentiated in SO many ways! For a student newly learning the names of coins you could make sure that they are only focusing on naming the coin that they pull out of the jar (as you see see below in the picture), for students learning to count coins you can mix coins or keep them all the same (depending on skill level). When I created this game I created a set of each so this game would be able to travel to middle school with this student! Write Bankrupt on one or more of the Popsicle sticks. 1. Students sit in a circle and pass the can around and take a stick when it is their turn. Students say the name of the coin or coin value(s). If students are correct they place their stick in the middle. If incorrect place the stick back in the jar. 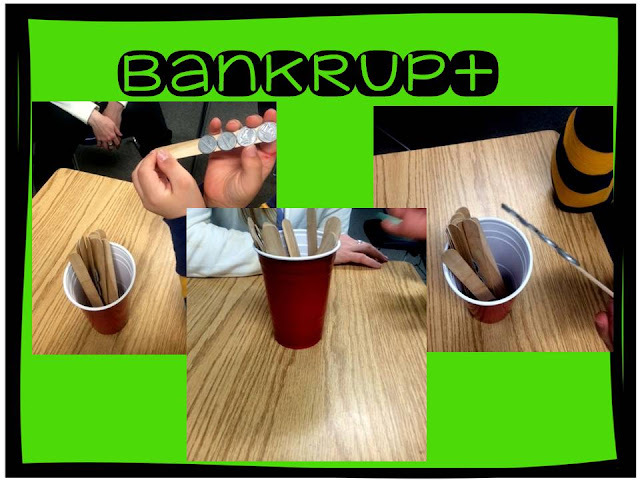 When your students choose bankrupt you put all the sticks back in the jar. 2. Students sit in a circle and pass the can around and take a stick when it is their turn. Students say the name of the coin or coin value(s). If the student is correct they get to keep their stick. If incorrect it goes back into the jar. 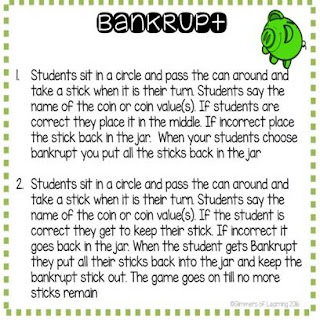 When the student gets the Bankrupt stick they put all their sticks back into the jar and place the Bankrupt stick to the side. The game continues until no more sticks remain. I have created this direction freebie for you to put onto your plastic bag or storage bin! Click on the picture and it will take you to my TPT store so you can download the directions! Interactive books are my students favorite way to practice skills and keep them engaged in learning! Each page of the books has something that the student might purchase (some are a little far fetched but kids love them!) and they need to count the coins and figure out how much it costs! As you can see all of the answers are Velcro pieces and are visible while going through the book. I have created numerous money books and they go great for centers, checking for understanding, morning work and informal assessments. Bundle of all these books as well as any NEW ones I create! This game is played just like you used to play war as a child but with money! I have created cards with coin values up to $1. I plan on adding more cards soon to bring the total of coins up to $2! If you have never played war before you divide the cards up evenly and they students lay them face down. Each student flips their top card over and whoever has the highest amount of coins will collect the cards that are flipped over and add them to their pile. Keep going until, you run out of time :), or until one person has all of the cards! Click here to access the free version on my TPT store! Hope this gives you some new ideas on fun ways to practice or teach the value and names of money!